The college baseball season has just barely gotten underway, so there's still time to take a look at who the game's top players are expected to be the spring. After previewing all of the top conferences from all across the country over the past few weeks, the SCS.com staff has come together to compile a list of the nation's top players, a list that has been formed into the site's First and Second Team All-America squads. 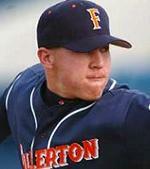 Among those recognized is Preseason Player of the Year Wes Roemer, the Cal State-Fullerton starting pitcher who is expected to be dominant on the west coast in 2007. Of the fifteen players nationwide who earned First Team honors, five of them were from the SEC, while the ACC boasted four selections. Conference USA was the only other league with two selections, both from Rice. The Owls were one of only three teams, joining Vanderbilt and Georgia Tech, to place more than one player on the First Team.